The good folks at PetCareRX and DogWork.com are hosting a FaceBook contest that could mean free pet food for the winner and a charity called Educated Canines Assisting with Disabilities. The contest? The Dogs at Work FaceBook photo contest. The only trouble is: I'm not really sure Lulu works at much. Or at least nothing I've been able to photograph well. She protects me from the cat. She howls to let me know there are random things outside. Test out the new cat bed. Haven't been told if it has the seal of approval yet. She gets muddy so that I can give her a bath. She warms up my spot on the bed. She tells me when it's time to get off the computer. So what do you think? What does Lulu work at well? And what does your dog work at? Go to FaceBook and let PetCareRX know! PS: Only two days left in the Tampa Bay Time Photo Contest and Cappy the dachshund still only has 25 votes? Please, please, someone vote for him! You help raise money for literacy and education, and mom can win prizes! PLEASE go to Tampa Bay Times' website. Also... if you have voted, please go back and make sure you actually distributed your individual votes. You have to do that. It tripped me up and it tripped up others. To do that, go here. This has been long time coming. I should have written it weeks ago, but I've been so crazy busy and it's been tough to go through my mess of notes. But without much ado, here is my list of the 10 things I learned about pets and pet blogging at Barkworld Expo 2012. A caricature of Lulu and Cappy, done at Barkworld. Making your site a go-to for the local community, and a way to bring your community together to get behind pets is not easy. There is no magic bullet, or at least pet bloggers have not found a magic bullet to get people interested in forming local pet communities. It is a function of my blog, but I've found it hard here as well. I need to go to Meetup.com and start doing more digging for local dog groups. We met the founder of Meetup.com, Matt Meeker, and he talked about how hard it is even in the Meetup.com community. But it is important to build those bonds. Orlando has great potential... we just need to all break out of our shells. The pet blogger community is huge! It's more than dogs and cats. And if you want to grow your blog, you need to network. LinkedIn is not as confusing as it seems. I did a seminar on LinkedIn, and I'm already putting into practice what I've learned to grow my connections. Hopefully that will lead to bigger things. You don't have to get involved on EVERY Social Media platform. At Central Florida Blogger Conference I learned that you have to Engage and Socialize. And while it is still essential to do both, it is not essential to do it on all platforms. In other words, I don't need to be bigger on Instagram, or get a Tumblr account. But I would still like to grow my Facebook page. 26 likes is pathetic. If you're reading this, please follow me on Facebook at Facebook.com/Luluthebeagle. Don't be afraid to introduce yourself. My mother is awesome at this. She was at Barkworld, and she was lighting up the Exhibitor Area. It was impressive. I called her my herald because she was always a table ahead of me, announcing my presence to the room. I am horrible at this. I never know what to say at the moment I need to say it. I've never been good at selling myself. If I want to be able to monetize my blog, I have to learn to do this better. There is money. Wow, is there money. Lulu and Cappy pose with Day 1's swag haul. The Amish have puppy mills. And they're mean about it.This broke my heart. We heard a presentation about the documentary "Madonna of the Mills." This woman, a dental hygienist from Staten Island, NY, goes to puppy mills in Pennsylvania's Lancaster County and rescues pets who can no longer breed and would be otherwise killed -- shooting, dropping bricks on their head, that sort of thing. I spent many summers and winters in Lancaster, and learning this really hurt. Did we support puppy mills as we looked for fresh produce, apple butter and shoo-fly pie? I hope not. Check out the documentary if you can, either by going to the Madonna of the Mills website or looking for it on HBO. It really is eye-opening. Helping rescues and pet charities is easier than you think. Last week I posted about easy ways to help pet charities this holiday season. Some of them I first heard about at Barkworld, like Iams Home 4 the Holidays. Check them out. I also learned helping can be easy as a tweet with the right hashtag, or nominating a charity for a contest, or liking a company on Facebook, or buying a collar. I'll be talking about Project Blue Collar more next week. You can also go to Be the Change 4 Animals for more simple ways to help. My influence is critical.A majority of Americans consider a product based on the recommendation on a blog. That's power. It should be used to do the most good. You don't need lots of blog pageviews -- you just need to be engaged and influential. Pet blogging is already a niche. Dog blogging is a smaller community. Beagles even smaller. Beagles in Orlando even smaller still. I've been trying to climb into a higher niche, but the bottom line is -- I don't need 100,000 page views a month to be influential and to get companies and other groups to work with me. I just need to show that I have an important voice. Lulu is an awesome dog. Some didn't get to really experience that, because she barked at certain dogs -- a lot. But I think she showed people at the conference that she is a fun, funny and talented pup. She got to be part of a special Petco demonstration for their Train to Adopt program, where they go into shelters to teach volunteers to help dogs become more adoptable. Those are my 10 things I learned at Barkworld. I can't wait for the next one (already have my ticket!). I leave you with the video of Lulu's demo with Lina from Petco. And I hope she's thankful she's not here anymore. Have you done your shelter drive-by yet? Blog Paws is sponsoring a blog hop in conjunction with Iams Home 4 the Holidays, fellow bloggers, and they've extended the deadline to Nov. 25. They're trying to get 100 blog posts. Please get involved. Here's my blog post. Cappy's Photo Contest Update. Cappy only has 25 votes! Please consider voting if you haven't already. You have until Nov. 30. Also... if you have voted, please go back and make sure you actually distributed your individual votes. You have to do that. It tripped me up and it tripped up others. To do that, go here. She knows what the holiday season can be like. Everyone is running around, with tons of stuff to get done. Everyone is tired. We have barely enough time to remember our fellow humans in need, let alone pets in need. So in the spirit of the season now upon us, here are some easy, great ways you can help animal rescue groups and charities in need. Iams/ Eukanuba has an annual effort to get the community to help local charities, and provide large support to two particular charities in dire need. All you have to do is go to the Iams Home 4 the Holidays site. There you'll find a list of participating shelters, broken up by state. Find a local shelter or rescue to donate to. You can also go to their website, and find a wish list of items they need. Many you can pick up at the grocery store (laundry detergent, hand sanitizer, that sort of thing). Then do a shelter drive-by. Just stop by the shelter and drop the items off. I did that Monday. I picked up a big bottle of laundry detergent and some towels (don't want to spend too much money on towels? Check the end caps at Target!) , and took them to SPCA of Central Florida. Are you on Pinterest? Here's an easy way to help pets in need. Bissell, the vaccuum cleaner company, is running Pinning for Pets. Just create a pin board called Pinning for Pets, choose two animals from Petfinder.com who need to be adopted, and two Bissell products and pin them to the board. Then fill out the form on the Pinning for Pets page and include the URL for the board. That's it. Bissell will donate up to $50,000 to the Petfinder Foundation. Lulu has no interest in being a reindeer this year. But she's been a pretty good girl, so I'd love to take her to see Santa. Starting Monday, Nov. 19, you'll be able to take your pet to Orlando Fashion Square on State Road 50. Pet Nights with St. Nick run every Monday from 6 p.m. to 8 p.m. To take part, just bring your pet on a leash or a carrier through the Premiere Cinema entrance into the mall. That entrance is on the back of the mall off Maguire Boulevard. Pet Nights with St. Nick run until Dec. 19. Fashion Square is not the only place doing pictures with Santa. Petco Stores is having photo sessions with Santa on Saturday's in December. At the Millenia Petco, the photo sessions are on Dec. 15 and Dec. 22 at 2 p.m. The West Orlando Petco on State Road 50, meanwhile, has photos with Santa on Dec. 8 and Dec. 16. To find out if the Petco by you is doing holiday photos, just head to the Petco website and check out your local store's events! Cappy is my mom's long-haired dachshund, which she got at the SPCA a few months ago. 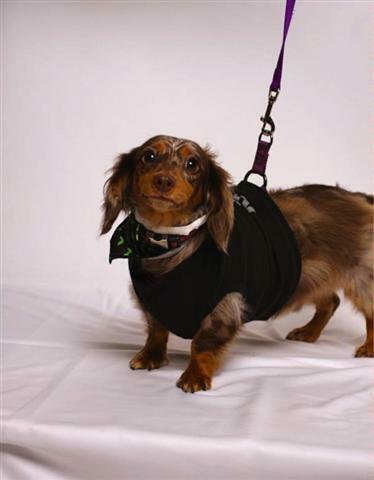 He was at Barkworld in October, he now has his own blog, and now he's in a photo contest! Cappy is in Tampa Bay's Cutest Pet Photo Contest, by the Tampa Bay Times. The proceeds from this contest will benefit Newspaper in Education, a program that provides class sets of newspapers to schools all over the Tampa Bay area (Citrus, Hernando, Pasco, Pinellas, Hillsborough and Manatee counties). They also help promote literacy. Please vote for Cappy. The voting period opens Wednesday at midnight, and closes Friday, November 30 at noon. Each vote costs $1, and you have to buy a minimum of five votes. But again, the money will go to a great cause. My mom and dad use the newspapers to help teach about current events in their classrooms in Pasco County. I mean, look at him. He looks so sad with those big eyes, as if to say "please, help my Mommy and Daddy keep newspapers in their classroom." To vote for Cappy, go here and search for him by name. UPDATE: I realize some people are uncomfortable registering and voting online. I have a PayPal account, so if you want you can send the money to me and I can vote for you. If you are interested, email me. UPDATE 2: I also realize the contest process is convoluted (it's run by teachers and journalists, what do you expect?). Once you buy your votes, you have to then ACTUALLY vote for the pet you want. It's very confusing. Thanks for your patience. On Sunday we honor all the men and women who fight for us and have fought for us Americans. And while you're thinking about our veterans, considering our military dogs instead. The National Monument for Military Service Dogs will soon be finished, and we'll get a sneak peak of it at the Tournament of Roses Parade in January in California. Then it will head for Lackland Air Force Base in San Antonio, TX. You can help by going to Petco and buying Natural Balance. The dog food company is making limited edition Jerky Bar Treats. Buy a bag for your dog, or buy a bag and donate it. All of the proceeds will go toward the monument. Natural Balance is trying to raise $1 million. By going to the Natural Balance site, you can also enter to win a trip to the Tournament of Roses parade. The treats are $19.99 a bag. But that's not all you can do. Lackland Air Force Base is where the military trains its service dogs. They have two programs that civilians can help with. The first is a puppy fostering program. 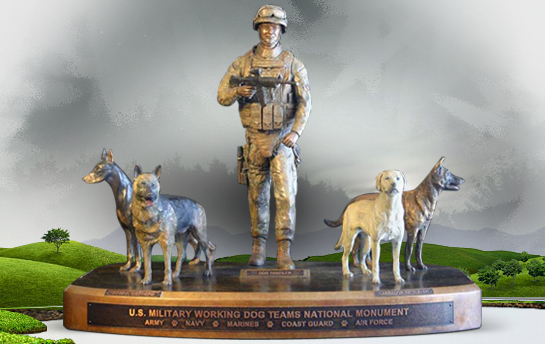 The military breeds its own service dogs. They need people to foster puppies from 12 weeks of age up until six months. To help, you can fill out this application on the Lackland Air Force Base website. The military also has an adoption program. They adopt out dogs that do not make it through the training program, or retired dogs. Until 2000, the dogs were often euthanized. To adopt a military dog, you first have to request an application. To get that information, go here. Lulu, Galadriel and I want to thank those who fought for my freedom and yours. Happy Veterans Day! Lulu and I also were featured in the Orlando Sentinel: the article and in the video on the Paws for Peace walk for domestic violence victims and pets. In the past month, 12 people in Central Florida died at the hands of domestic violence or abuse. That's why this past weekend, people and pets, hand in paw, walked to help victims of domestic violence -- not just humans, but their animals. The annual Paws for Peace walk started with a reminder of innocence and hope. They released butterflies, honoring all the victims. So many butterflies, they were tough to get out of the container. 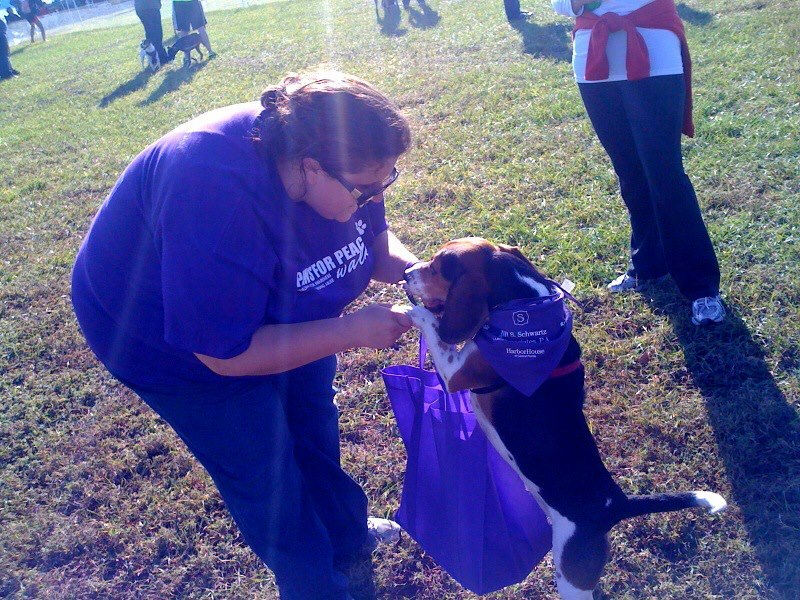 According to Harbor House of Central Florida, sponsor of the Paws for Peace walk, in 2010 there was one domestic violence homicide every two weeks in Orange County, Florida. It's a huge problem in our area. Harbor House has a shelter for victims and their families. And soon they'll have a shelter for pets too. According to the American Animal Hospital Association, an estimated 88% of pets living in households with domestic violence are either abused or killed. Of all survivors who enter shelters to escape violence, 57% have had a pet killed by their abuser. Lulu met lots of dogs at the Paws for Peace walk Saturday. Dogs of all shapes and sizes, all lending a paw to a great cause. Not only did humans raise money for Harbor House and the shelter (I raised $140 thanks to you guys -- my loyal friends, family and readers), but puppies helped raise money too with a special photo contest. Lulu entered. People voted for the best looking dogs. I don't actually know if Lulu won anything, but people loved her. Harbor House then raised even more money selling shirts, bandanas, and raffle tickets for awesome prizes. All told, more than $18,000 was raised for Harbor House. That will go a long way toward finishing the shelter and helping families. But unfortunately, there's still more that needs to be done. If you're in the Orlando area, please consider helping Harbor House by going to their website. Do you know what the domestic violence is near you? Do they have a way to help victims with pets? Look them up and find out how you can help them. Perhaps it's just a donation. Perhaps they need someone who can help take those pets in. There are only 70 domestic violence shelters in the country that can make some provision for pets. And if you need help finding a shelter near you, or you need help getting out of your situation, you can go to the National Domestic Violence Hotline website. There is also a phone number you can call: 1-800-799-SAFE(7233). Lulu is confused again. Lots of food, treats, toys -- and she can't have ANY of it! It's not for her though. It's all the donations people gave at Doggy Day Out Orlando a few weeks ago at Barber Park. Check out the link above. I posted pictures from the event. All these items went to Harbor House of Central Florida today. They will all be part of the Paws for Peace kennel, which opens in December. What's next? We will host another event after the holidays. But first, Harbor House of Central Florida is having their Paws for Peace walk this Saturday at Blue Jacket Park. 48% of domestic violence survivors delay leaving an abusive home because they don’t have a safe place for their pets. Pet abuse is often a retaliatory action of abusers. Animals are used as leverage by the batterer as a means to control their victims or as part of a pre-emptive strike to gain or maintain control. These statistics were provided by Harbor House. So please, help me by donating to the Paws for Peace website. My personal goal is $125. You can go to my personal fundraising site to donate. If you can't donate, please at least help me spread the word. Pets should not be used as pawns for violence.